Stone type: White, magnesium limestone. 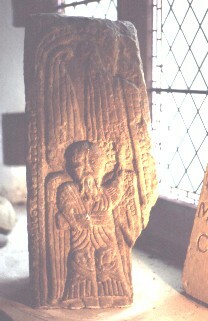 This panel has a bearded angel with four wings. He is holding a book or roll in his right hand and his left hand is raised. The figure is under a round arch set on capitals on shafts with beaded ornament.